Jerry Seinfeld’s Onscreen Parents: The Most Fascinating People in Hollywood? I feel like I could write a book about Barney Martin and Liz Sheridan—a.k.a. Morty and Helen Seinfeld. Though they played typically sweet, overbearing parents on Seinfeld, the actors had some surprising real-life backstories. Jerry’s father, Morty, first appeared on the show in the first-season episode “The Stakeout”—played by Phil Burns. By the time he appeared again in the second season, he’d gotten more hair, distinctive dark-framed glasses, and a much-jumpier persona in the person of Barney Martin. Martin was a former New York Police Department detective who launched his comedy career by giving funny presentations to deputy commissioners. He got his start in Hollywood as Jackie Gleason’s stand-in on The Honeymooners in the 1950s, and as a writer for Name That Tune and The Steve Allen Show. He went on to appear in the 1968 Mel Brooks movie The Producers (as a drunk in a bar) and the 1981 Dudley Moore comedy Arthur. In between, he enjoyed a robust Broadway career that included originating the role of cuckolded husband Amos Hart in the musical Chicago. Before Seinfeld, he appeared in character parts on shows from The Odd Couple to 21 Jump Street. Actress Liz Sheridan played Jerry’s mother, Helen, from the beginning. At 61, she came to the show with experience on sitcoms (ALF and Family Ties), dramas (Cagney & Lacey and Remington Steele), and soaps (Santa Barbara). She’d spent the early years of her career as a dancer in New York City, where she grew up, and where she also had a youthful affair with future superstar James Dean. 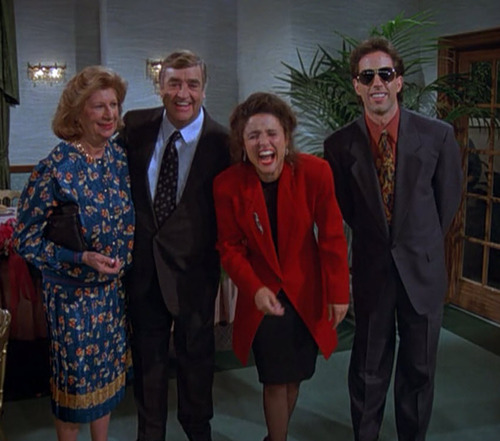 Seinfeld was bemused when he heard about his onscreen mom’s steamy past: “So, you were a friend of James Dean, huh?” he heard after hearing of her rumored paramour. She explained that, yes, she and Dean had been each other’s first loves before he went off to become a star in the films East of Eden and Rebel Without a Cause, then died in a car crash at 24. From then on, Seinfeld would just periodically ask her, “Got any good Dean stories?” She spoke of the January 1952 night when they first met, at the time she was a dancer on The Milton Berle Show. She said Dean had lived on shredded wheat and tapioca pudding while trying to land parts. She recalled their shared love of bullfighting and the apartment they eventually lived in together on the Upper West Side. And though I’m not writing an entire book on them, Sheridan covered her own story in her 2000 memoir, Dizzy & Jimmy: My Life with James Dean.